How can I manage my suppliers' availability? You can define periods of unavailability for your suppliers. For each supplier, you can define periods of unavailability. When outsourcing a job, the system indicates if a supplier is available at that moment. Your search for the right supplier for a job is then optimized. 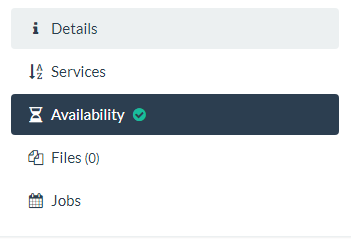 To define a period of unavailability for a supplier, you have to click on the Availability tab in the supplier's details under People > Suppliers (on the left). You can then easily define a period of unavailability by clicking on the "Add unavailability" button. You can of course delete any of these entries or modify them using the buttons on the right.